Track your work with this plugin and activitywatch.net. Ever wanted to know where you spend your time? The Plugin is a Watcher for Visual Studio. It enables tracking of all, you do in your solution. We send this data to an Activity Watch installation on your machine, all tracked data belongs to you. 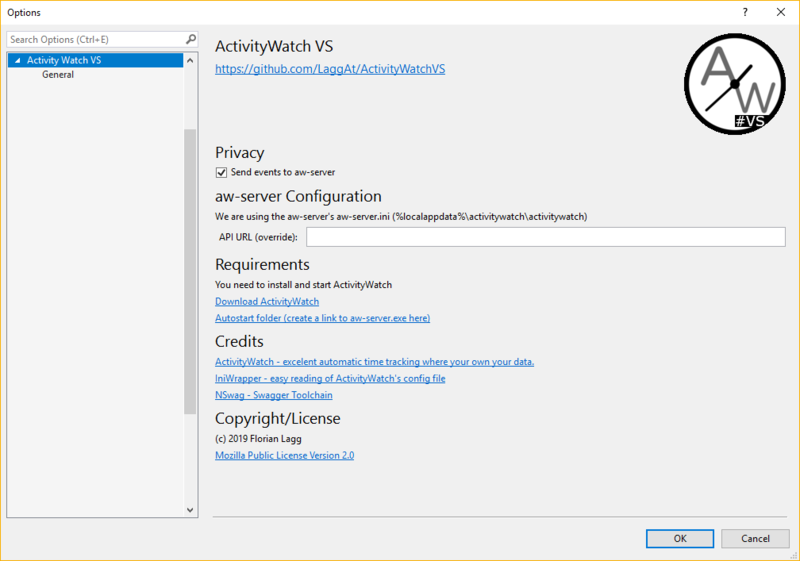 ActivityWatch tracks windows titles, we extend this functionality from inside Visual Studio. This VS plugin tracks your edits in visual studio. When you start to work on another file or after some time we send these events to ActivityWatch, usually running on localhost:5600. If we cannot send events we try to start the ActivityWatch process once. We search different locations. For this to work place the binaries inside an 'ActivityWatch' folder inside %AppData% or Program Files folder. Usually you don't need any configuration. We try to read the ActivityWatch config file, else use the ActivityWatch defaults. If you need to you can configure the URL to the ActivityWatch service or (temporarly) disable the event pump.